You CAN free motion quilt! You have to start somewhere and this class is the place. Lots of encouragement and some stress free practice will get you going. We will start with making sure the tension is right and move on to 8-10 different beginner quilt designs. You will leave realizing that you can do this! There are no quilting rulers in this class...we will use those techniques in an Advanced Quilting class. 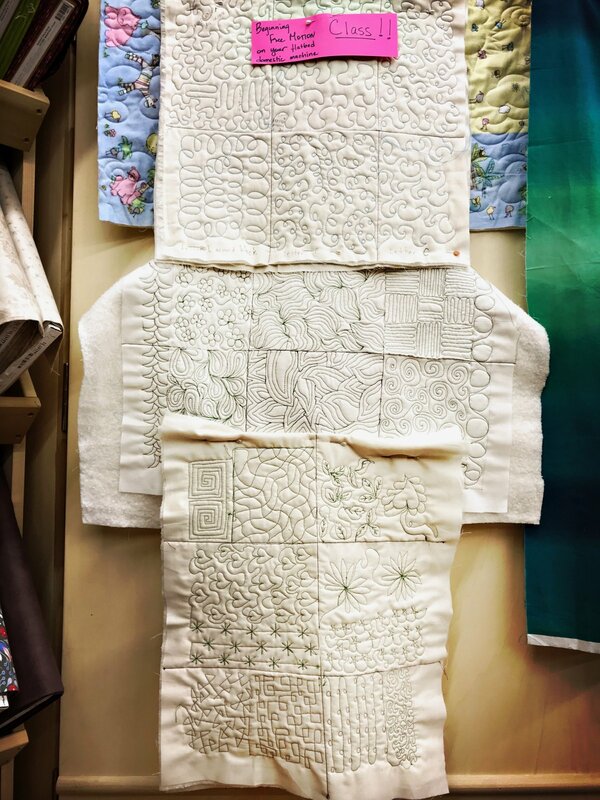 Requirements: Bring (4) 15" x 15" square quilt sandwiches (Top, batting & backing) made of muslin or light colored solid cotton fabrics with batting in the middle. It is fine to use fabric spray to sandwich them together (please spray at home if that is your preferred basting method.) Also bring contrasting thread, your free motion quilting foot (not a walking or dual feed foot), the extension table for your machine , quilting gloves, pencil & paper and perhaps a couple of different sizes of needles. Make sure your machine can do free motion quilting...feed dogs must drop and you must have the free motion quilting foot for your machine (a clear foot is nice for visibility) Bring basic sewing supplies including your sewing machine (if you would like to use one of ours please call in advance so that we can move one to the classroom for you), a rotary cutter, scissors, pins, a quilters ruler.